On January 12, over 200 visitors came to celebrate art in our community with the opening of the 28th Annual Acadia Art Exhibition. This year’s exhibition features over 220 works and highlights a wealth of talent from local artists. What makes this non-juried show so special is that it is open to everyone, from current and former students to faculty and members of the community. Some artists are veterans of the show, and their works have graced the walls (or plinths) of the gallery every year. For others, this is their first time sharing their work with the world. Exhibitions like this are what make the gallery a cultural centre and home for art in the Valley. But it’s not just for the artists. Year after year, the Annual Exhibition is one of the gallery’s most popular shows and gives people the opportunity to come together and appreciate what makes the Acadia community so wonderfully unique. The importance of community is a core value of the Acadia University Art Gallery, and that extends from our oldest to youngest members. 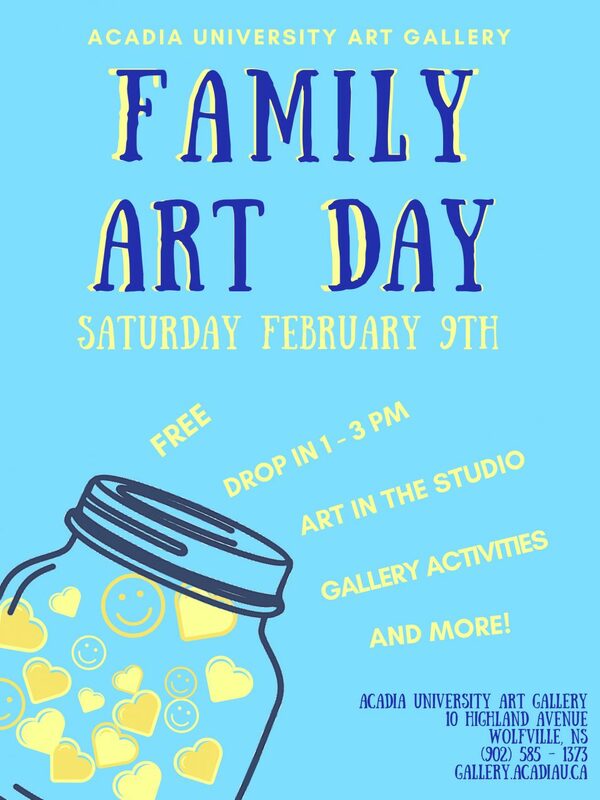 In support of getting children engaged in art and their own creativity, we will be holding our first Family Day event of 2019 on Saturday February 9th. Children of all ages are invited to come visit the exhibition and use their creative inspiration for a variety of art-making activities in the gallery. Tutorials on making your own Kindness Jar will be held in the art studio and led by myself (a second-year B.Ed. Elementary student here at Acadia). This is a free event and families are encouraged to drop in from 1:00pm to 3:00pm. We look forward to seeing you there! The 28th Annual Acadia Art Exhibition is on view until February 15th. We are closed Mondays, open Tuesdays – Sundays, 12-4pm, and Wednesdays until 7pm. Want to learn more about our collection and behind-the-scenes stories?